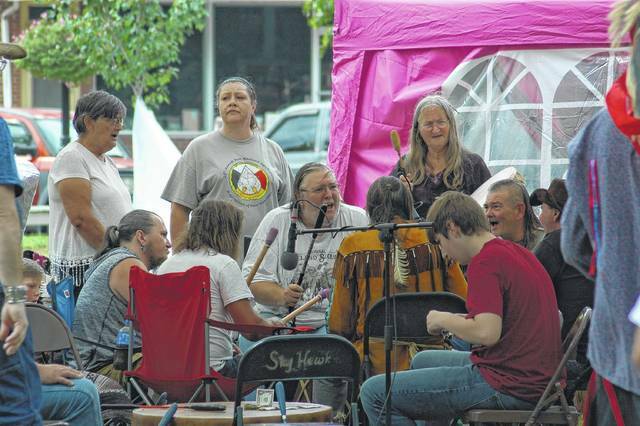 GALLIPOLIS — Tents could be seen in the Gallipolis City Park all weekend as the Native American Education Association held its’ eleventh annual Harvest Moon Pow Wow. Held each year on Labor Day Weekend, members of many tribes get together to celebrate Native American culture by practicing rituals and practices that reach back to their heritage and then share that with the public. Rona Stevens Roach is one of the event organizers. “It’s both educational for the public, we want people to come and see. And it’s a celebration for the tribe members,” said Roach. All three days featured dancing, drumming, and singing in the traditional way. Anyone with the right clothing, known as regalia, was welcome to participate in the arena. Some dances welcome public participation. The candy dance brought children into the ring where they danced for candy. Other dances displayed the heritage of the Native American people; the men’s traditional dance, Jingle Dress dance, and Grass Dancing. “The way it was explained to me, is that when a tribe would move their settlement to a new place dancers would go into the new area and do this dance to pat down the grass,” stated the Master of Ceremonies Aaron Stevens. Several vendors from across the country were on hand as well, selling items like bows and arrows, pelts, pouches, braided and beaded items, and peace pipes. Some vendors also sold authentic Native American food also. The weekend also seeks to honor veterans, as the Veterans of Foreign Wars post 4464 Honor Guard were present as well. Several of the participating dancers are veterans. They were given special honors Saturday afternoon. The Native American Education Association is a local group that started 11 years ago to help gain sponsorship for the Harvest Moon Pow Wow. They received sponsorship for the event from several groups including the Ohio Arts Council and local businesses. The group represents multiple tribes including Arapaho, Shawnee, Shoshone, Blackfoot, Cherokee, and others. Roach assured that the group will return for its’ 12th annual pow wow next year on Labor Day Weekend. The Grand Entry is the ceremonial start of the Pow Wow. It is led by tribal leaders, flag bearers, and other important persons. One dancer Monday afternoon gave a performance that delighted the crowd, always speeding up to keep with the beat of the drum. Bud Eaglewolf played the flute, entertaining the crowds with stories about the history and culture of the Native Americans. Many people came out to witness the pow wow Monday afternoon. Some in the crowd were dressed as frontiersman. The drum circle had many players in the ring, driving the dancing with their singing and steady beat. The Master of Ceremonies Aaron Stevens explained the different traditions and coordinated the various dances. The dancers featured a variety of regalia (traditional dance clothing); from head dresses to staves. Many of the dancers were women, performing their own dances and with the group. Here dancers move to the drum as the Grand Entry concludes. Some of the dancers were dressed in special regalia for certain kinds of dances. Some of these young girls wore jingle dresses. Those in the drum circle were also responsible for the vocals, carrying a dramatic and powerful tone for the dancers to move to.